Exclusive apartment in the heart of Rome just a stones throw away from the Coliseum, Roman Forum, Mouth of Truth, and all the major important historical sites. Excellent location, lots of amenities, bright, comfortable space, would come back! This unit is bright and cheerful, with a well-stocked kitchen and other amenities. We really like having a space other than the bedroom to relax in and the couch and chair in the living room were great. It is in a great location, with easy access to transit and walking distance to several lovely areas. We could hear neighbours (TV, laughing, someone watching a sporting event, someone playing piano quite well) in the evenings but never too loud and it was always quiet by about 9:30 or 10:00 pm. Alina checked us in, showed us how everything worked, and offered some helpful suggestions about how to use the transit and local attractions. We really enjoyed the restaurant at the corner, Il Gianfornaio, and we took advantage of being 5 minutes from the Tiber with walks along the river almost every day. We certainly recommend this location. Quaint and cute but not in the nicest area of Roma. Property is cute and the pictures are accurate. However, the area has graffiti all over it and it isn't quite as close to the Coliseum and Forums as it seems. The restaurants around it are descent but there's not many of them. The bed in the bedroom was very comfortable as was the sofa sleeper. However the sofa sleeper is incredibly loud anytime someone moves on it. The owner is friendly as was the person who greeted us on our arrival. The advertisement says "Just renewed". That is misleading. The apartment may have been renewed a couple of years ago. It was okay. Nothing plush or luxurious, just okay. It was certainly adequate. The apartment is in a good location to explore Rome with some good restaurants nearby. We have just returned from a week in Rome and loved this location. The apartment was exactly as described. We are a family of four with two teen sons, and this apartment accommodated all of us comfortably. Highlights of the apartment: the living room has both a pull-out couch and chair (can sleep up to three in living room); bed in the bedroom is very comfortable and a perfect place for an afternoon nap; air conditioner works really well; wifi was fast; location is safe and very quiet; water pressure in shower is great with plenty of hot water. 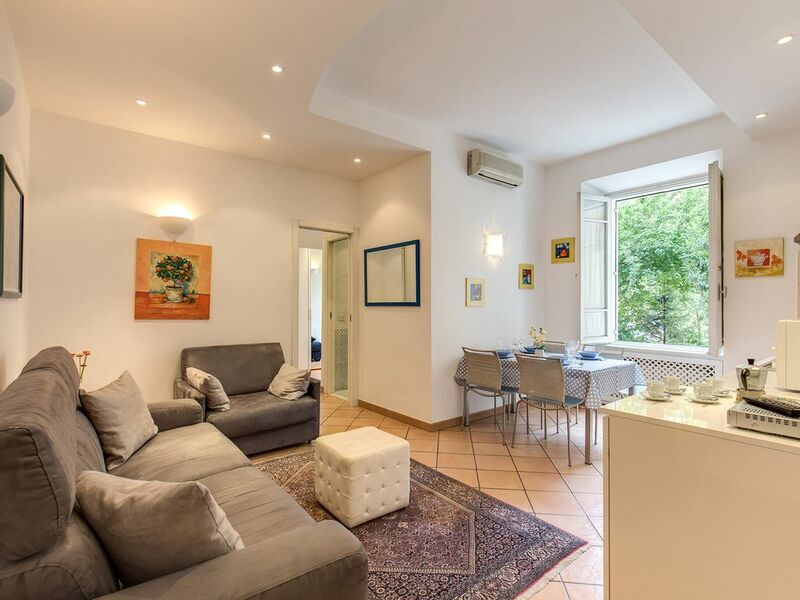 The location of the apartment was quite convenient with an easy walk (~ 15 min) to Trastevere, the Jewish Ghetto and Capitoline Hill/Colosseum/Roman Forum. There is a bus stop right in front of the apartment and a metro stop a few blocks away. Tickets for transportation can be purchased two doors down at the Tabacchi shop. We did not use this transportation, since the taxi service in Rome is wonderful and convenient. For a family of four the cost of the taxi is relatively similar to the cost of the bus/metro. I highly recommend downloading the app "My Taxi" which worked perfectly! It is similar to Uber in the US- but is the preferred taxi app in Rome. With this app the taxi comes directly to you- never took more than 3 minutes- and then drops you at the destination that you type into the app (don't need to worry about pronouncing the location correctly). The other convenience is that it is cashless- use the credit card on file with the app. Technically you don't need to leave the block to eat... there is a bakery/espresso place next door, an excellent pizza place around the corner, and a gelato place directly across the street that serves great gelato and is open from 7 am to midnight. We also LOVED the food at Nonna Betta (Jewish Ghetto) and La Gensola (Trastevere). Location, location, location! This was fabulous for our two-week stay in Rome. Our goal was to live like a Roman, but be sure to visit all the tourist sites. The bus line was right outside the gates to the apartment building. There is a phenomenal cafe, Gianfornario a few steps away, a great Pizza place next door, and a gelato place across the street! Walk a few blocks and there are many shops where the language is only Italian, children play in the parks and the restaurants are authentic old world cooking. Il Forno Antico was our favorite. The apartment itself was perfect and as described. The kitchen was well equipped, the furniture and bed very comfortable. There was a washing machine which came in handy for our stay. Although there is no dryer, typical in Italy, the drying rack worked just fine! Everything in the apartment was very clean with more than enough closet space to arrange belongings for our stay. Although there were folks above us, we rarely heard them and there was no disturbance from the street. We arranged airport pick up and return through our host who was there to greet us when we arrived. We would definitely return to Testaccio and this apartment! Dear Sylvia, thanks a lot for your review I hope to see you again in Rome! We stayed here for five nights in July and the location was fantastic. Very close to the bus and surrounded by fabulous restaurants. We especially loved Pizzeria Da Remo right around the corner and ate there several times. The condo is very modern and clean and the air conditioner was like ice. I highly recommend this place! The apartment has a very warm atmosphere. It has an entrance that leads to a bright living-room with sofas, a dining area with open kitchen, a bedroom, the bathroom and walk-in wardrobe. The sofa is a confortable sofa-bed (King size, excellent quality), there is also a single bed. The kitchen has all modern fittings and it is fully equipped with all necessary cooking supplies. The bedroom has a large King size bed and plenty of wardrobe space. The beautiful bathroom has a big box shower. Just a few meters from the property you'll find the famous 'Bocca della Verita' (Mouth of Truth). In the porch of the mediaeval Church of Santa Maria in Cosmedin on the south side there is one of Rome's symbols, the so-called Mouth of Truth: this is a large round stone, with a grotesque face in relief with holes through the eyes and the nose, and a larger opening for the mouth.Viewers of the film 'Roman Holiday' will remember the scene in which Gregory Peck alarmed Audrey Hepburn by inserting his arm in the mouth and quickly withdrawing it with his hand concealed in his sleeve. In the past centuries, according to legend, the mouth was believed to close on the hand of anyone hearing false witness, particularly women accused of adultery. And this 'test' is still a must for all tourists. The price are based on 2 persons.